While in Philadelphia for the annual ISTE conference I spent a short amount of time walking through the vendor area and swung by the Google booth. In the midst of checking out the Chrome Books, I grabbed a couple pair of their freebie Google Shades. I gave one to a friend and brought two home to my sons. If you have two kids you know that you can’t bring home just one of anything! Somewhere along the way a handful of us, that hung out at ISTE, starting taking pictures of ourselves and eventually our kids wearing the Google Shades in various locations. We started tweeting them to each other and then created a posterous site to share our collective pictures. Initially this was just a fun thing to do with friends online. However, I thought it might be cool to take it a step further and bring the Google Shades Project into our classroom. Wouldn’t it be cool if we could get a ton of these glasses and have our students take them to places special them and take a picture and write a little something about that place? What a cool way to get to know our classmates better and learn about our community through the eyes of our peers. As with most things I often try to take it a step further and set myself up for an even bigger project. I tossed an idea out to our original group of Jeremy Macdonald, Kristina Peters and Josh Allen that we go global with this thing. How cool would it be to have these glasses go out to kids around the globe who can take their Google Shade picture and share their stories? What a great way to bring the world to our classrooms and our classrooms out to the world. The group was all over it and we began brainstorming ways to make it a reality. Thanks to some great connections we brought in Rich Rikker who knew some folks inside Google that might be able to hook us up with a ton of these glasses. At time of this post we are still awaiting word from Google about the shades, but we are optimistic. We hope to eventually have this project look similar to a Flat Stanley project while putting our pictures and stories that we collect on a Google Site and the locations pin pointed on a Google Map. For me, I teach world history and it is often difficult to have 6th grade students understand the cultural, societal, and physical differences of people in different places on the globe. What better way to learn about these people and places as well as develop an understanding and perspective than from people living there? Jeremy, Kristina, Josh, Rich and I will surely be sharing our journey and I encourage you to follow along as we go. If you are potentially interested in taking part in the Google Shade Project please fill out this form. At this point we are still very much in the idea generating stage and don’t be surprised if you don’t hear from me initially as we move forward with this. We will be looking for classrooms, specifically overseas, that would be willing to have us send them a pair of Google Shades. Then we would ask that they have their students take pictures wearing the shades in a place important to them. We have all seen pictures of the Great Pyramids and the Eiffel Tower. We would hope to see more” off the beaten path” and personal locations that we would normally never see. Below is an example of the type of entry we would be looking to gather from locations across the globe. 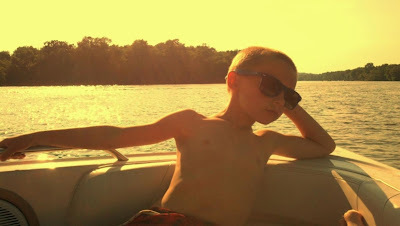 This picture is of my oldest son Tanner while boating with my younger brother on the Rock River in Dixon, IL. Dixon was the home of US President Ronald Reagan and has a rich history as a trading post and military encampment during the Blackhawk Wars in the early 1800s. It was the first time we had been out on my brother’s new boat and we all had a blast. One of Tanner’s favorite things to do is hang out with his uncles and his cousin Cole who is just a bit younger than him. On this particular day we spent time swimming, tubing and watched my younger brother do some wake boarding. We even pulled up to a large sand bar and spent some time swimming there while watching a guy on another boat pull in a large bass on a fishing line. At the end of the day, Tanner was chilling up on the front of the boat and my older brother, who was also with us, snapped this picture. I hope to have many more days on the river with my brothers and our kids enjoying the water and fun times. Great project idea. If you want to send a pair to Hawaii we can show it's more than surf and 5-0. Cool idea! I teach 6th Grade in NC and would love to participate! Love this project! I'm in too! Would it be possible to send a pair to Argentina? My 5th graders will love this! I have a stuffed gorilla that was given to me by a neighbor I grew up next to. He became my class mascot. When I was teaching 4th grade I let him go home over a weekend with every student. They woukd take a picture with him over the weekend as well as write what he did in his notebook. He even went to Walt Disney World! At the end of the year I made a book of his travels and gave to each student. I now have those books available for current students to read about his adventures. I also have former students (now freshman in high school) asking me if I still have Gus. Having those connections are great for students! Great post! Great idea! Will go well with my writing plans. Love to have a few pair in Westport, MA. Love the idea! Another way to break down those classroom walls! Thank you, thank you, THANK YOU for this great idea. I always attend the big "hitter" conferences during the summer looking for the next "big" idea for the upcoming school year. I left ISTE this year without my next project. THIS is it. Thank you for sharing such a terrific idea. Good luck on turning this in to a "Flat Stanley" project. I will definitely join you. Keep us updated. By the way, I always enjoy your blog. Keep writing!